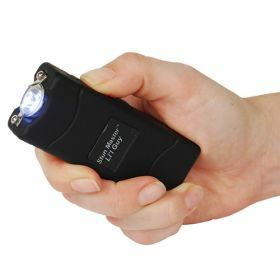 Stun Master's Li'L Guy Stun Gun is small and compact but don't let this fool you, this little stun gun packs a mean punch with its 12 million volts/4.4 milliamps of pure power. You can just see and hear the power come out of the heavy duty metal prongs as you press the on button. When we call this little we mean this unit is only 3¾" x 1½" x ¾" and will fit nicely in the palm of your hand, pocket or purse. Li'L Guy has a super bright 120 Lumens LED flashlight at the top of the unit. This stunning device is rechargeable so no more expensive batteries to buy. The charger is built into the unit, just flip the plug out to charge and when done charging flip it close again. Very easy to operate. To operate the stun gun you will notice the buttons on the side. When to safety switch is off when in the down position. When in the middle position the LED flashlight will be activated. The up position of the switch the voltage is turned on and ready to release once the trigger is pressed. The Stun Master® Li'l Guy Stun Gun is available in 8 different colors: Black, Purple, Red, Pink, Green, Animal Print, Blue, and Snake Skin.